Harry Kane’s stoppage-time header clinched a tense 2-1 win for England in its opening World Cup game against Tunisia. Kane opened the scoring in the 11th minute during England’s dominance of the early stages. But Tunisia equalized when Ferjani Sassi calmly slotted a penalty in the 35th and pushed the young England lineup right to the limit. Kane’s winning header came as the clock had just ticked over into injury time. Standing alone at the far post he guided a Harry Maguire header into the Tunisian net. His winner came at the end of a second half during which Tunisia defended deep and nullified England’s attacking intent. Despite that disruption and England’s early attacking intent, Tunisia slowly built up momentum and got an equalizer when Ferjani Sassi calmly slotted a penalty into the left corner of the England net and past the dive of goalkeeper Jordan Pickford. The penalty was awarded after Kyle Walker was adjudged to have caught Fakhreddine Ben Youssef with his arm. Tunisia has gotten even with England with a goal from the penalty spot in the 35th�minute. – Associated Press writer Pan Pylas reported from Volgograd. The ”Telstar 18” ball is being used in Russia, a remake of the ”Adidas Telstar” used at the 1970 tournament. 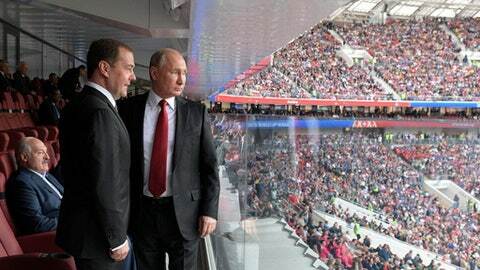 He’s among lawmakers who drafted a bill imposing a fine of 10,000 rubles ($160) against anyone who criticizes the team. Milonov is best known as the author of Russia’s law against gay ”propaganda” toward minors. Though it’s fair to say the insects are harmless enough, the swarms can be a distraction. England coach Gareth Southgate has picked an attacking lineup for his team’s first match at the World Cup against Tunisia in Volgograd. Michael Murillo had Panama’s best chance of the game when he received a pass free from markers inside the area in the 54th, but the defender didn’t control the ball cleanly and allowed goalkeeper Thibaut Courtois to make a save charging from the net. David de Gea is set to remain in goal for Spain despite his mistake in the team’s 3-3 draw against Portugal at the World Cup. De Gea badly misplayed a shot by Cristiano Ronaldo before halftime in the team’s opener last Friday. De Gea had a superb season with Manchester United but he also made a mistake in one of the team’s final warm-up matches before the World Cup. Egypt coach Hector Cuper says he is ”sure” Mohamed Salah will be fit to play against Russia in the World Cup on Tuesday, although the forward still needs to prove his fitness ahead of the match. Salah, the Premier League’s player of the season, was an unused substitute in Egypt’s 1-0 loss against Uruguay on Friday as he recovers from injuring his shoulder while playing for Liverpool in last month’s Champions League final. Mertens’ shot went over Panama goalkeeper Jaime Penedo and into the top far corner. Newcomer Panama was holding Belgium’s talented team to a 0-0 draw at halftime in Sochi. Belgium pushed forward from the start and it didn’t take long before it was threatening Panamanian goalkeeper Jaime Penedo. But the Central American squad survived despite allowing its European opponents to create significant chances up front. Croatia’s squad has been reduced to 22 players after forward Nikola Kalinic was sent home following the team’s 2-0 victory over Nigeria in their opening World Cup match. Coach Zlatko Dalic announced his decision Monday. Dalic says he wanted to use Kalinic as a substitute in the second half but the AC Milan forward, who was already warming up, told him he was not able to play because of a back problem. Dalic says Kalinic did the same in a World Cup warmup against Brazil and also didn’t train with the team for the same reason Sunday. Croatia next faces Argentina on Thursday. Croatia’s media speculated Kalinic was not happy with his role in the team. The other man tried to leave the train when he heard about the first man’s injury and came into a conflict with other British people and police. When he ”failed to comply with legal demands to stop his hooligan acts,” he was detained at a Yelets police station, the police statement added. No details of the men’s identities were released. Colombia’s coach Jose Pekerman says he’ll pick his lineup for Tuesday’s World Cup clash against Japan only at the last minute. But the coach also said he won’t rule out last-minute changes. Pekerman said the Colombia team that will play Japan in Saransk is more balanced than the one that hammered Japan 4-1 four years ago in Brazil. He said the team’s objective is to reach at least the quarterfinals as they did in 2014. – AP Sports Writer Mauricio Savarese reported from Saransk. Former Manchester United great Eric Cantona has joined the legions of football fans mocking Neymar’s new haircut. The Brazil superstar has puzzled people with the dyed blond ”spaghetti” hairstyle he revealed during his team’s opening game at the World Cup on Sunday. ”Neymar style… spaghetti al dente!” Cantona wrote. News of a deadly earthquake and an accidental hotel alarm blaring around 5 a.m. made it a rough morning for Japan’s World Cup squad. Coach Akira Nishino, who built his reputation coaching the club Gamba Osaka, said he and a number of his players know people who’ve been affected by the quake, making it harder to focus on the eve of its Group H opener against favored Colombia in Saransk. Osaka is Japan’s second-largest city, and the 6.1 magnitude earthquake killed at least three people – including a 9-year-old girl – and injured hundreds. The quake also knocked over walls and set off fires. Nishino said he and players found out about the earthquake shortly after it happened because the hotel had a false alarm – which blared for about 15 minutes – around the same time the earthquake struck, shortly after 8 a.m. in Osaka, which is six time zones ahead of Saransk. – AP Sports Writer Brett Martel reported from Saransk. Mbengue was in Orlando City’s youth system and played for the Major League Soccer team from 2012-14 before transferring to Caen. FIFA has opened disciplinary proceedings against Mexico after its fans used an anti-gay slur in Sunday’s 1-0 win over Germany. Mexico’s football federation has been repeatedly fined by FIFA over fans chanting the slur. The Court of Arbitration for Sport canceled two fines against Mexico in November, ruling the chant was ”insulting” but not meant to offend, though it left other fines in force. Before that, Sweden had controlled the game and shown most of the attacking intent but couldn’t find a way past South Korea backup goalkeeper Jo Hyeon-woo. In a ceremony at the Mamayev Kurgan – The Motherland Calls – monument in Volgograd, fans James Lockett and Billy Grant helped commemorate the hundreds of thousands who are said to have died during one of the most important battles in World War II, a battle that helped turn the tide against the Nazis. Britain’s deputy ambassador to Russia, Lindsay Skoll, and Greg Clarke, the chairman of the Football Association, also took part in the ceremony in Volgograd, which used to be called Stalingrad. England takes on Tunisia later Monday in both teams’ first match at the World Cup. It’s the second game in a group that began with Mexico’s 1-0 win over defending champion Germany on Sunday.